Like farmers, most children’s authors need to diversify! 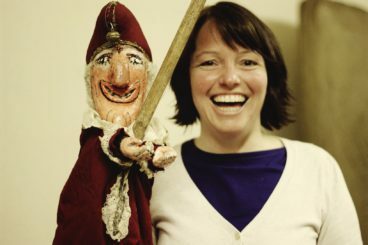 Barbara Henderson tells us about her own unique approach which includes puppetry and food demonstrations. It’s festival season, and I am going to give it all I’ve got. 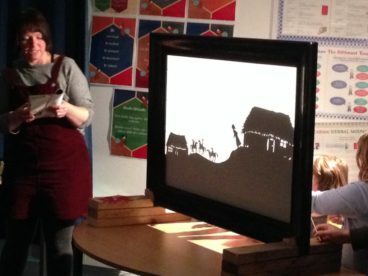 A huge shadow puppetry screen, a roll of thick black paper, multipacks of scissors. A shopping bag stuffed with hand puppets, both modern and old-fashioned/wooden. A packet of six giant inflatable seagulls. A violin case, containing (wait for it) … a violin! Books about myths and legends, and a nature spotter’s guide to Scotland. A rail of tartan hats, kilts and waistcoats. Other props include a plastic scythe, a false nose, a baby’s napkin and a giant blue sheet, shimmering in the summer sun. Children’s authors are a resourceful and diverse lot, but if I have learned anything ahead of the publication of my third book for 8-12 year-olds, the eco-thriller Wilderness Wars, it is this: Children’s authors are like farmers – we have to diversify to make ends meet. In order to be hired, and paid (!) for events and festivals, we have to ensure that we are an attractive package. So, what do I bring to the party that makes me unique? Could I do some storytelling? How hard could it be? Not so very different from performing a puppet show in front of a noisy group of kids, surely. I was lucky enough to have been invited to several festivals last year, including the Nairn Book and Arts Festival and Islay Book Festival. This year my new book will be launched in Edinburgh on 16 August (pop along if you like, Museum of Edinburgh Lecture Theatre 4.30-6pm. The inflatable birds will feature as it is a book about nature fighting back…) and I am also appearing for the National Trust as part of the Nairn Programme again. Yes, I will talk about my book, but the event will also feature Wilderness Wars-inspired shadow puppetry and a nature-themed story-telling session, in keeping with the book’s eco focus. In August, I will also take part in the LIVE!/BEO festival where I am going to run a brief creative writing activity for primary aged children, demonstrating how we can and should play with story possibilities. In the afternoon, I am thrilled to appear on a panel judging young people’s pitches for arts funding. 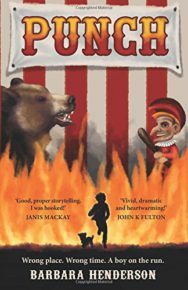 At Dingwall’s Word on the Street Festival in September, I have agreed to run a general puppetry workshop, with readings from my books to inspire each activity. Of course, others approach me to appear at events, but it is up to me to offer a range of interesting and attractive options for activities, and to say yes. Always. With each book, there is an enormous opportunity to reinvent yourself as a writer. Nothing is wasted, every skill or experience you bring is going to be valuable, I realised. You just need to pluck up the courage to tap into the rich compost of your past experience and watch the possibilities grow. 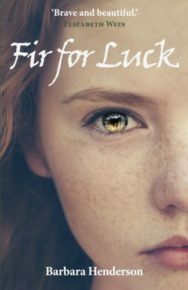 As a keen baker, I’d researched the recipe and ingredients for the staple diet during the Highland Clearances during the writing of my debut, Fir for Luck. 19th Century rural Scotland ate beremeal scones, apparently. 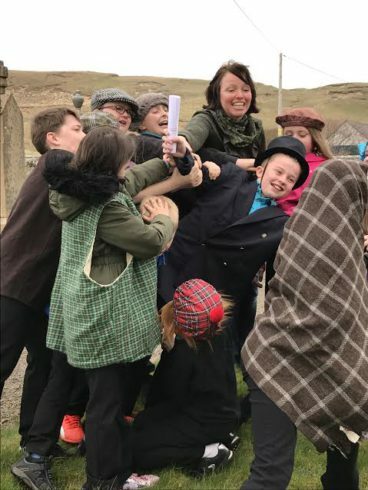 It was a small step to offer Highland Clearances-style baking to schools as an activity during author visits, and it was popular – and surprisingly delicious. This led to me being asked to do a cooking demonstration for adults at a festival Food Day – and guess what? While the scones were in the oven, I was able to give a reading from my book which helped sell a few copies. During school and museum events, my fiddle playing came in handy during impromptu village ceilidhs as I acted out scenes from Fir for Luck and improvised modern equivalents. 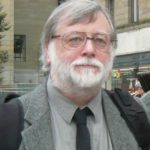 Of course there is a certain pressure – any event with an audience will generate that – but by thinking of as varied, interesting and diverse an approach to selling and marketing each book, we as authors give ourselves a better chance of being remembered, and ultimately being hired for festivals, conferences and school visits. And wherever there is an element of risk, things can go wrong, too. I remember a paralysing moment when two string puppets got entangled in a stage fight and I had to improvise my way out of it in front of a live audience who, I’m sure, knew desperation when they saw it. The time a child I didn’t pick for an activity bursts into tears, and the time I handed a child a dressing up outfit which would never fit. The moment Mr Punch’s stick, inflatable, refused to inflate, much to the amusement of my audience who commented with glee on my effort-reddened face. But when it works, it’s magic. Children who assume that a book event with an author may be boring can be proved wrong. They should be proved wrong. It’s festival season, and somewhere near you, a children’s author will give it all they’ve got. 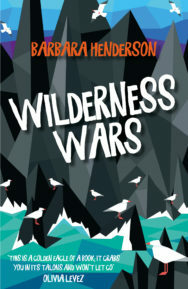 Barbara Henderson is the author of two previous novels for children, both of which are already used widely in Scottish schools: Highland Clearances tale Fir for Luck and Victorian boy-on-the-run story Punch. Wilderness Wars is her third novel. Set on a fictional island west of Harris, it asks the question: What if Nature fights back? 12-year-old Em is taken to live on the island while her father and others are constructing a luxury resort. But soon the workers and their families are beset by mishaps, setbacks and eventually, dangers. The wilderness has declared war. Barbara hopes it will prompt readers to ask their own questions: Do we value our wild places enough? And should we think twice before thoughtlessly imposing our will on them?